A man who killed his wife because she would not quit smoking has been detained indefinitely under the mental health act. 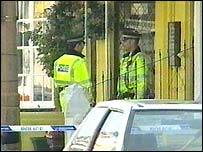 John Jarvis stabbed his wife, Patricia, and sons Stuart, eight, and John 11, at home in the Winslow Hotel, Blackpool in March 2003. The couple's 13-year-old daughter was present but not injured. On Monday Jarvis admitted manslaughter on the grounds of diminished responsibility. The couple, who married in 1986, had argued shortly before the killings about her smoking which had become an obsession for Jarvis. 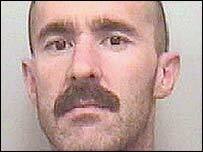 The court heard Jarvis killed his wife on 27 March 2003 saying he was "going to fix" her smoking habit. She was stabbed and had her heart cut out to prevent resuscitation. Jarvis admitted stabbing Stuart so he would not have nightmares about his father killing his mother. He then went upstairs to kill John saying he was going to join his mother. Jarvis washed himself and the weapon and stabbed himself. A police officer heard him say: "I tried to stab my heart out but my blade was too blunt." Police found a bloodstained Jarvis in bed with his wife with the Bible open at the passage relating to the devil and 666 being the "mark of the beast." Jarvis had written an e-mail after the death saying "Smoking by my wife - to all it may concern" adding that he had "given her and the boys absolute freedom". Judge Peter Openshaw accepted the manslaughter plea but added Jarvis had not escaped justice and may never be released. Jarvis spent two weeks unconscious following a road crash when he was 19 which left him with a mental illness which was undetected until the killings. But the judge also said: "The nature of the crimes which the defendant has committed have not been diminished. 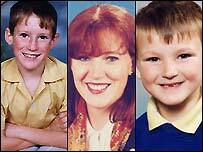 They were and remain truly dreadful, vicious and brutal,"
Detective Superintendent Ian Jones, who led the Lancashire Police investigation, said the attacks had been ferocious and Jarvis was a "cold and calculating individual." He paid tribute to the surviving daughter speaking of his "great respect and admiration" for the strength she had shown since the tragedy.